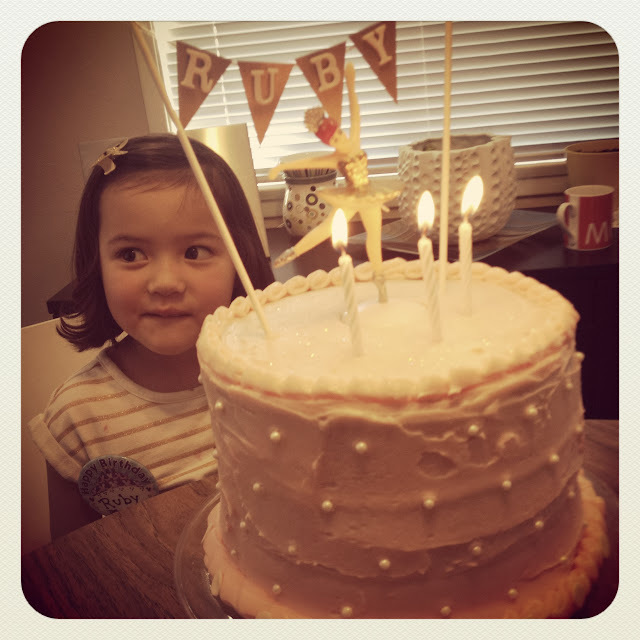 Operation Ballerina Birthday Cake: Cherry Vanilla Cake, from scratch! I have a secret to share: Four-Eyed Girlie is intimidated when it comes to making cakes. Making a perfect cake is hard. And I have this problem with needing things to be perfect. It takes work, and a lot of practice, and still — it’s not always perfect. But when it comes to my daughter’s birthday, I enjoy making them (perfect or not). I guess it’s because when I was a kid, my parents made me a custom birthday cake every year for my birthday. All I had to do was name a theme, and it was on! So now, I consider a special cake for my daughter’s birthday the ultimate labor of love. This year, my soon-to-be three year old muttered two words when the topic of cake came up: “Pink” and “Ballerina”. Whoa. This girl is SUPER girly these days. 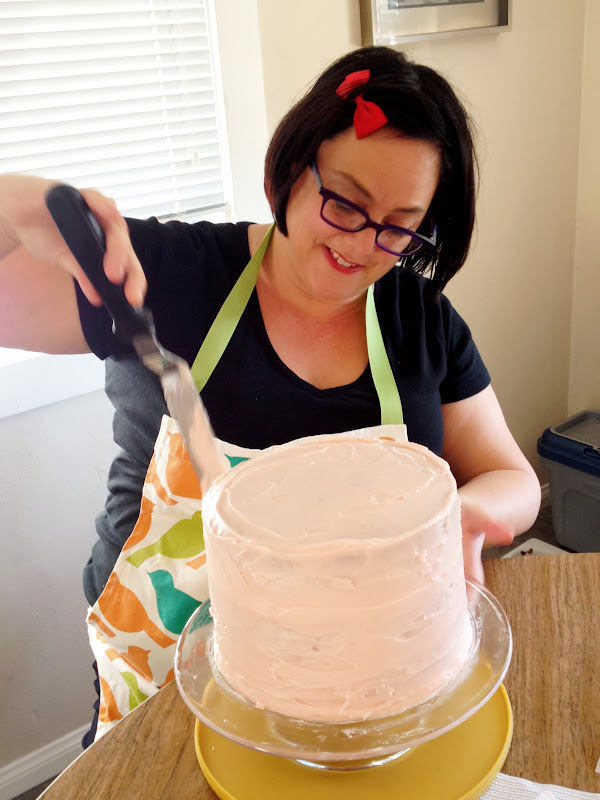 Although I’m pretty girly myself (I am a grown woman who wears a bow in her hair most days), a pink ballerina cake was still a little out of my comfort zone. But, it was her birthday request and I was eager to deliver. I wasn’t exactly sure how to go about the “pink” cake. I knew I could use food coloring and dye it, but that just seemed like a cheat. And strawberry cake mixes taste like … well, let’s just say they don’t taste so much like strawberry, but more like sticky sweet chemical sludge. So, I knew I had no choice — I had to find the ultimate recipe, from scratch. 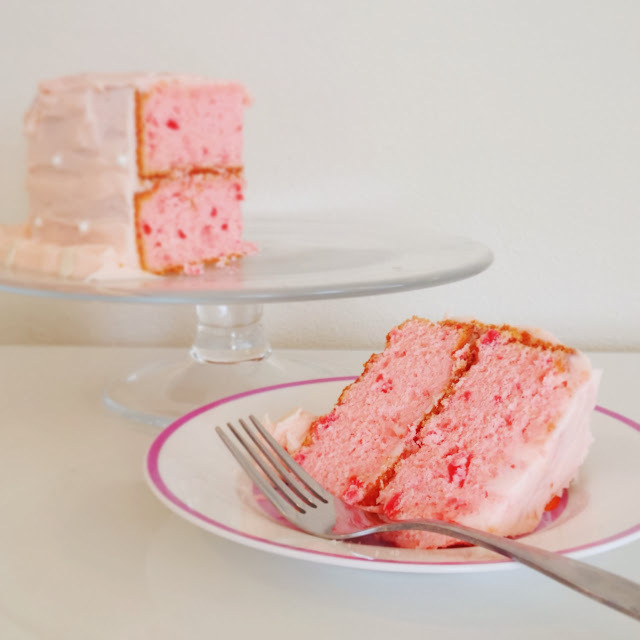 I went to the Sprinklebakes blog right away (she is a complete superhero and totally my idol), and sure enough, I found it: her Cherry Vanilla Cake recipe. This cake is no joke. 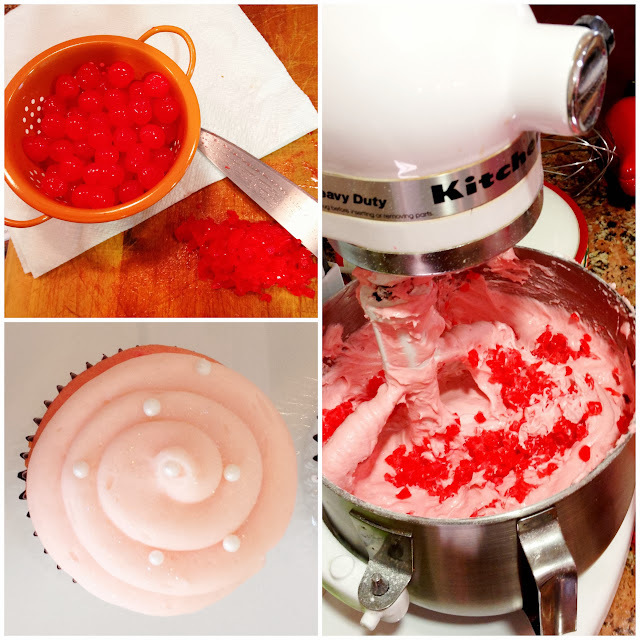 It uses maraschino cherries and the juice … and paired with almond extract instead of vanilla, it actually isn’t as sweet as you’d expect it to be. This baby is entirely from scratch … and guess what, it’s not difficult! Most importantly, it is the perfect shade of pink to make any girly-girl smile. I didn’t even need the optional food coloring in the recipe, the batter was pink enough, and the bits of cherries throughout were gorgeous! You really should make it yourself. Click here for the recipe. As for icing, I went with the Marshmallow Buttercream Frosting I used last year on my daughter’s jumbo sprinkles cake. I love this frosting SO much. I just added a teeny dab of Wilton’s pink color gel with a toothpick to get the perfect ballerina pink. Click here for the recipe. Of course, I wanted it to look “charmingly homemade” (it’s how I justify it to my perfectionist self!) 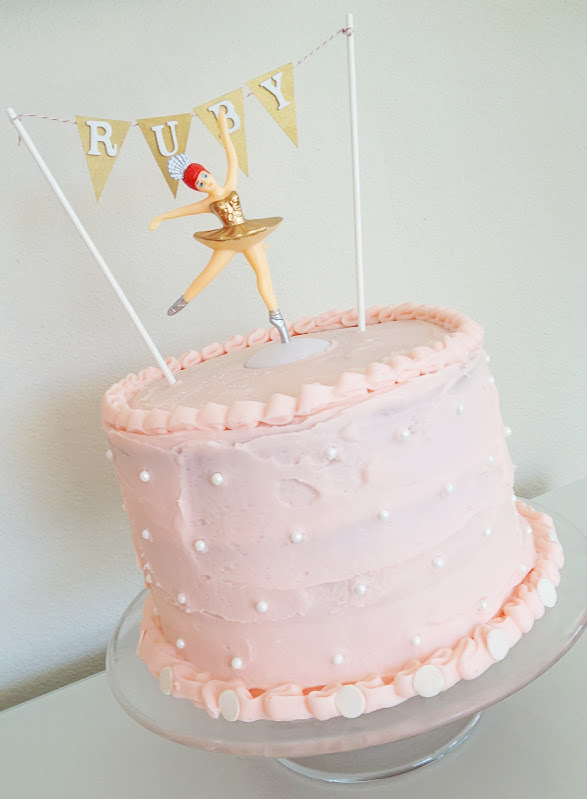 and slightly retro … so after I found a vintage looking ballerina cake topper, pearl sprinkles for the side, and iridescent glitter dust to sprinkle on top, I was all set. I took super girliness to a whole new level with this one! The birthday girl was thrilled though, and all the adults enjoyed this uber-pink creation as well. 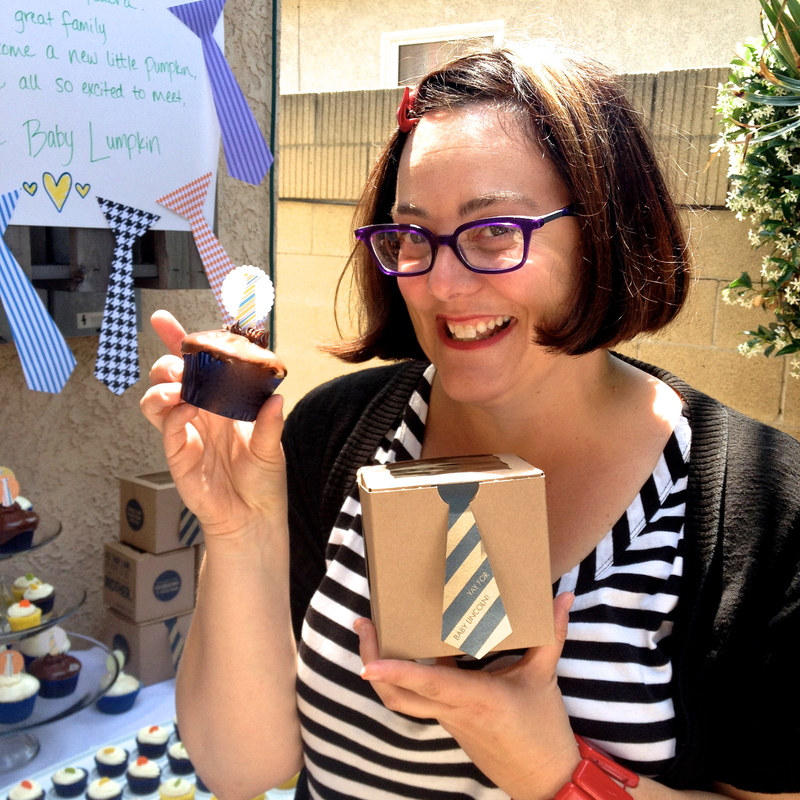 Sweet Treats: Making it work when results aren’t what you planned for! One of my favorite toddlers recently turned two, and I was asked if I would help with the birthday girl’s party sweets. I was feeling really ambitious and thought I’d try something like these adorable ice cream cone cupcakes at Bergdorf Goodman, but I was a little too ambitious! We got the cupcakes to bake quite well in the cones, but no matter how hard we tried, we couldn’t get them to be even sizes, and some were straight-up crooked and just wouldn’t stand up! So, I channeled my inner Tim Gunn and decided we’d make it work. 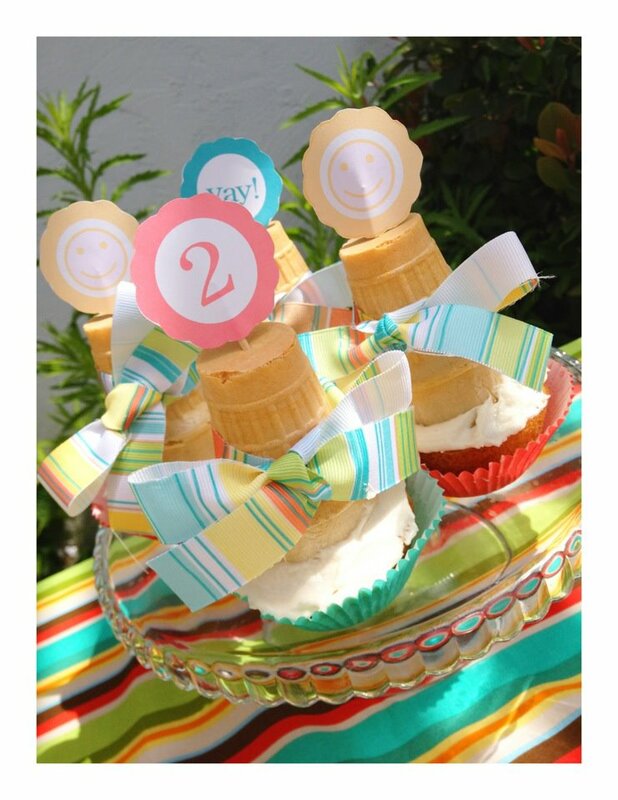 Afterall, cupcakes in the ice cream cones are so easy for a toddler to hold themselves, and with independence at a real high at this stage – whatever makes it easier for them to do things by themselves is a win. 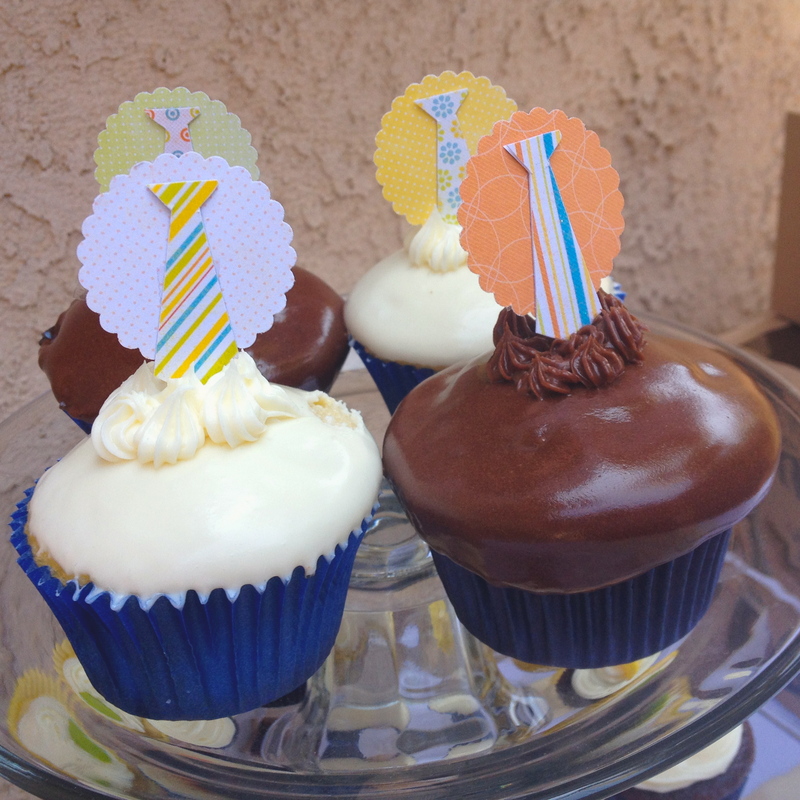 I decided to turn the cupcakes upside down and place them in color-coordinating baking cups to match the party theme, use a little ribbon to jazz up the “handles,” and I made little tags and stick them into the top. Voila! We pulled it off, and the guests had no idea the new upside-down treats were a happy accident! Would you like to download the tags to print yourself? Download here. 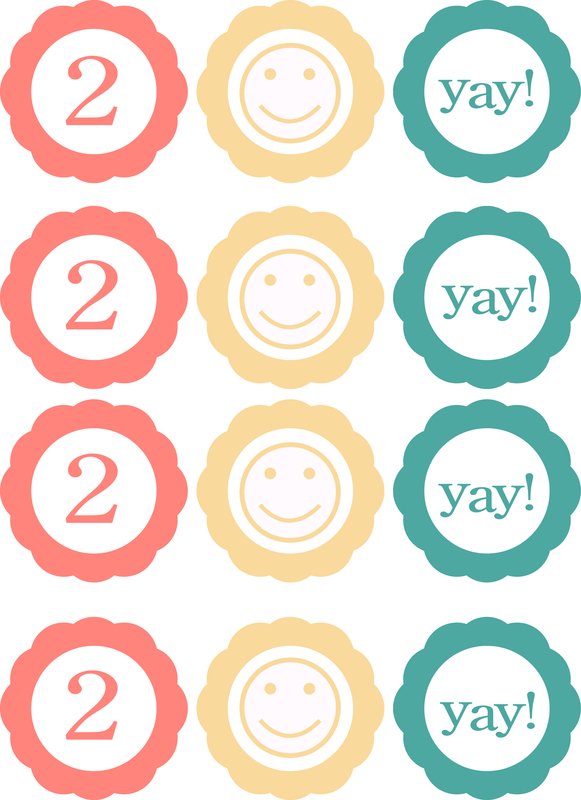 Just cut out and tape to a toothpick – they’re super easy! 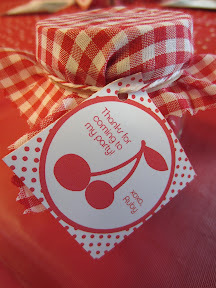 Party: A Retro Cherry Birthday! 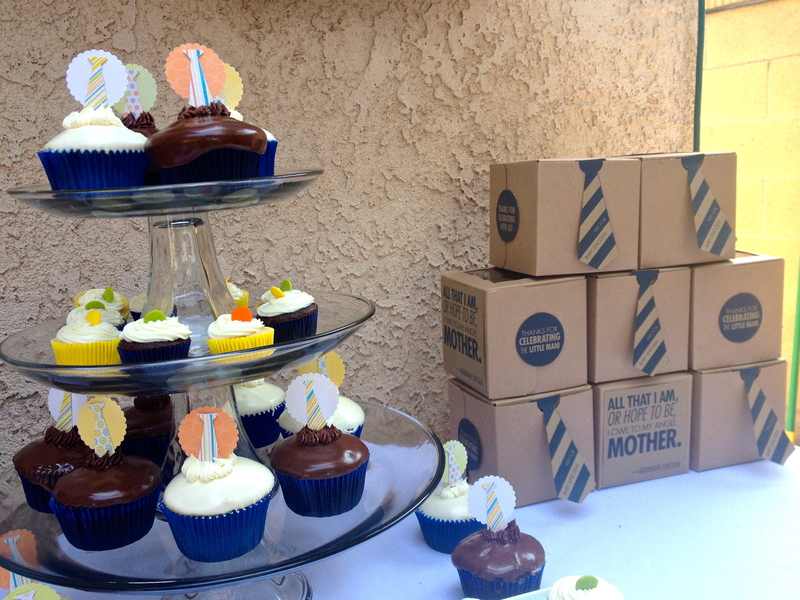 This post is sooo tardy, but it’s a week later and we’re still recovering from our daughter’s 1st birthday party! Of course, it was a lot of fun, but a huge reason it was so special was because of all the loving preparation that went into things from both sides of the family! 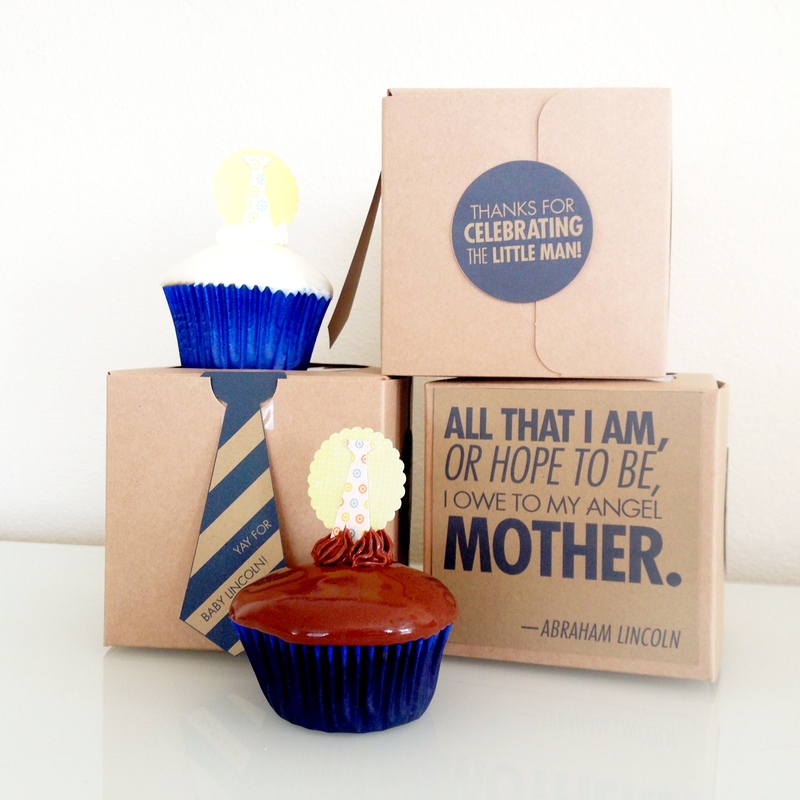 This post is to honor all of the handmade and homemade special details of our birthday party for the little miss! Go-ims are traditional decorative “towers” that are usually trimmed with hard candies and/or beans for a Korean 1st Birthday Party (dol). My husband and my mother-in-law lovingly spent days and hours working on these for the party! They used white beans, black beans, kidney beans, red/white/pink chocolate spree, black m&m’s and mentos to decorate all 3 of the go-ims. My husband designed all 3 of them first – he found an awesome tiger template to use in honor of being born during the year of the tiger, and he then he put together a retro-looking one with Ruby’s name and starbursts. 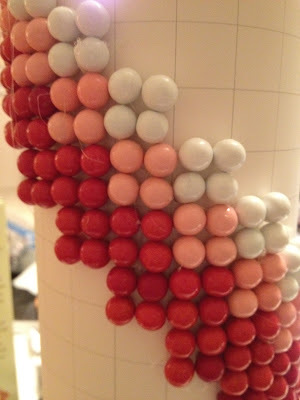 Finally, he mapped out a patterned design with all red, pink & white candies to look more pop-ish and modern. 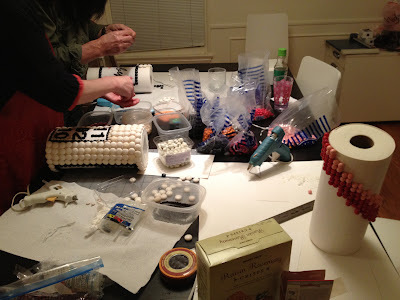 As you can see, each individual candy and/or bean was glued to the paper towel roll (which was covered with poster board to make it smooth) one at a time. Patience and determination prevailed! I wish we had remembered to take a picture of the back of the tiger go-im: My daughter’s birthdate (11-02-10) was on the back. This is the only pic we have where you can see part of it – but it looked great! Aside from incorporating some of the traditional Korean Dol traditions, I wanted the party to have a “retro cherry” theme. 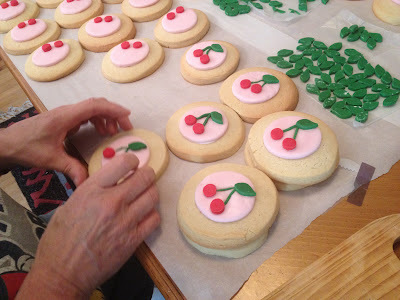 I saw a birthday party online that was a big inspiration, and it had these perfect cookies with cherries on top that I was dying to re-create (with my own spin on them of course). Since my parents are known for their masterful baking skills (they made 150 bride cookies and 150 groom cookies for favors at our wedding! ), I asked if they’d help me out. 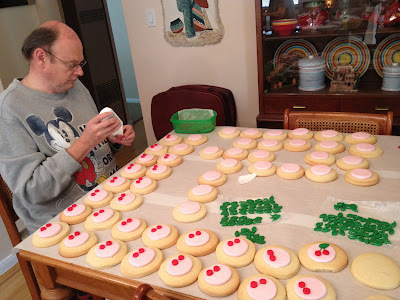 Mom baked 48 sugar cookies and whipped up a batch of her own buttercream fondant, and Dad set out to cut out leaves and cherries to decorate each cookie. 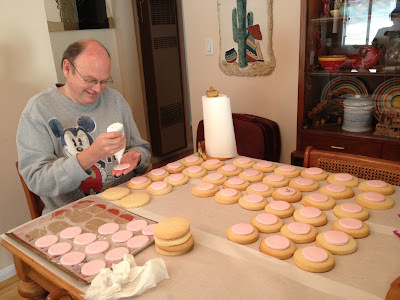 This was at the beginning when he was using royal icing to “glue” the fondant base to the top of each cookie. 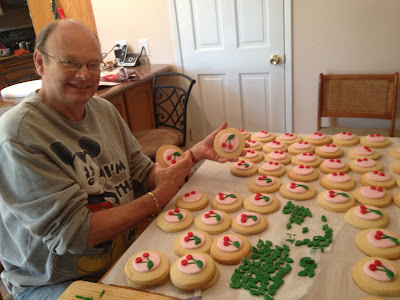 Then, he took the extra leaves that were left over to cut stems for each cherry (he’s meticulous!). 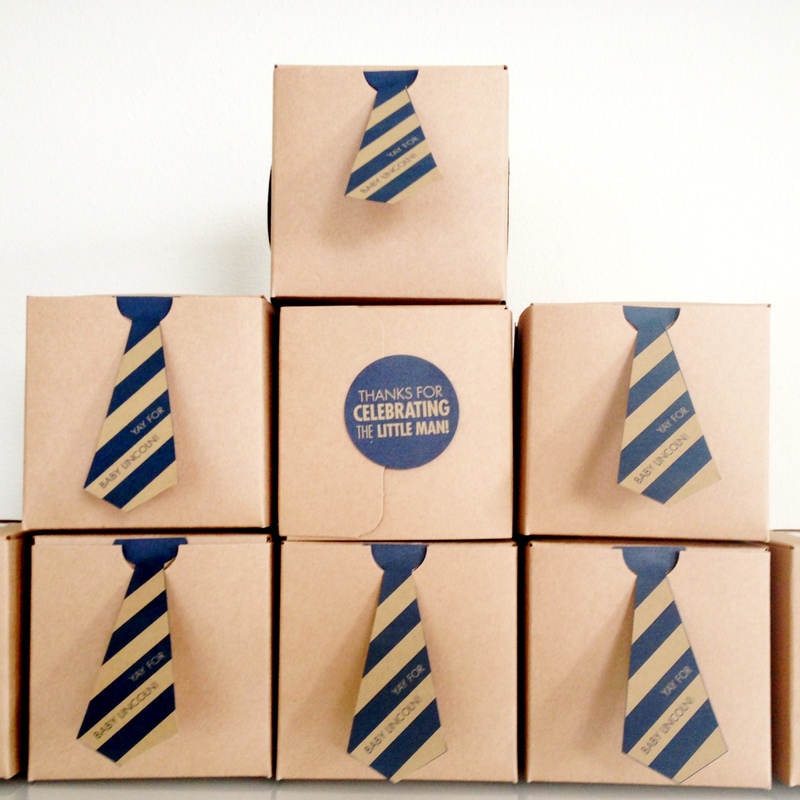 It really made them look all that more polished … and they tasted as good as they looked! I can’t thank my parents enough for this … there’s no way I could’ve pulled off this impressive array of cherry-themed treats without them!!! The entire spread in all of its glory! Since the actual process of burning CDs seems so wasteful these days with folks using MP3 players and all, we decided to ditch the actual CD and just post our compilation for download (You can download the playlist here, if you want). 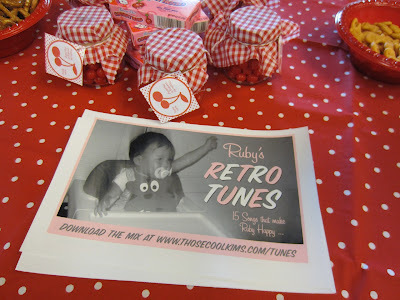 The mix is simply songs that make Ruby smile, with a retro slant (of course!). Overall, it was a fantastic day. We all even got to make our own onesies at the shower! Our host had the great idea, and she rounded up tons of fabric swatches, felt, stamps, paints, and ribbon for us all to make our own creation. 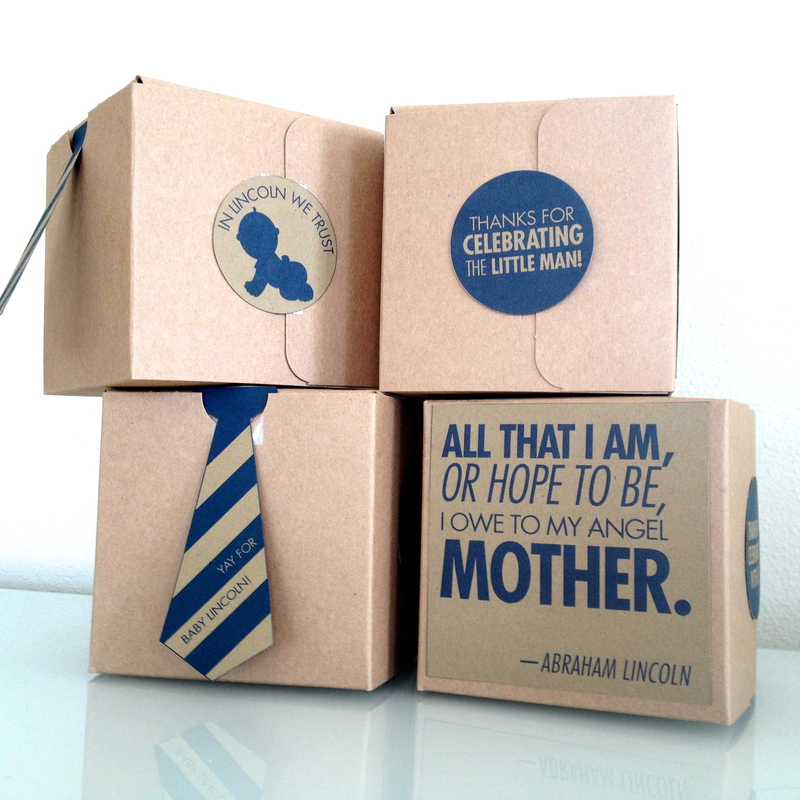 I love celebrating a new baby!